15:14:41,880 INFO [org.jboss.as.server.deployment] (MSC service thread 1-4) JBAS015876: Starting deployment of "Ruby-ds.xml"
15:14:41,880 INFO [org.jboss.as.server.deployment] (MSC service thread 1-1) JBAS015876: Starting deployment of "RubyGrand.war"
15:14:42,414 ERROR [org.jboss.msc.service.fail] (MSC service thread 1-2) MSC00001: Failed to start service jboss.deployment.unit. "Ruby-ds.xml".PARSE: org.jboss.msc.service.StartException in service jboss.deployment.unit. "Ruby-ds.xml".PARSE: Failed to process phase PARSE of deployment "Ruby-ds.xml"
15:15:35,519 ERROR [org.jboss.msc.service.fail] (MSC service thread 1-2) MSC00001: Failed to start service jboss.deployment.unit. "RubyGrand.war".PARSE: org.jboss.msc.service.StartException in service jboss.deployment.unit. "RubyGrand.war".PARSE: Failed to process phase PARSE of deployment "RubyGrand.war"
JBAS014777: Services which failed to start: service jboss.deployment.unit. "Ruby-ds.xml".PARSE: org.jboss.msc.service.StartException in service jboss.deployment.unit. "Ruby-ds.xml".PARSE: Failed to process phase PARSE of deployment "Ruby-ds.xml"
service jboss.deployment.unit. "RubyGrand.war".PARSE: org.jboss.msc.service.StartException in service jboss.deployment.unit. "RubyGrand.war".PARSE: Failed to process phase PARSE of deployment "RubyGrand.war"
15:16:47,872 INFO [org.jboss.as.clustering.infinispan] (ServerService Thread Pool -- 31) JBAS010280: Activating Infinispan subsystem. 15:16:49,032 INFO [org.jboss.as.server.deployment] (MSC service thread 1-2) JBAS015876: Starting deployment of "RubyGrand.war"
15:16:49,032 INFO [org.jboss.as.server.deployment] (MSC service thread 1-3) JBAS015876: Starting deployment of "Ruby-ds.xml"
15:16:49,114 ERROR [org.jboss.msc.service.fail] (MSC service thread 1-4) MSC00001: Failed to start service jboss.deployment.unit. "Ruby-ds.xml".PARSE: org.jboss.msc.service.StartException in service jboss.deployment.unit. "Ruby-ds.xml".PARSE: Failed to process phase PARSE of deployment "Ruby-ds.xml"
15:17:38,801 ERROR [org.jboss.msc.service.fail] (MSC service thread 1-4) MSC00001: Failed to start service jboss.deployment.unit. "RubyGrand.war".PARSE: org.jboss.msc.service.StartException in service jboss.deployment.unit. "RubyGrand.war".PARSE: Failed to process phase PARSE of deployment "RubyGrand.war"
10:42:52,767 INFO [org.jboss.as.clustering.infinispan] (ServerService Thread Pool -- 31) JBAS010280: Activating Infinispan subsystem. 10:43:00,558 INFO [org.jboss.as.server.deployment] (MSC service thread 1-4) JBAS015876: Starting deployment of "RubyGrand.war"
10:43:00,558 INFO [org.jboss.as.server.deployment] (MSC service thread 1-2) JBAS015876: Starting deployment of "Ruby-ds.xml"
10:43:01,285 ERROR [org.jboss.msc.service.fail] (MSC service thread 1-1) MSC00001: Failed to start service jboss.deployment.unit. "Ruby-ds.xml".PARSE: org.jboss.msc.service.StartException in service jboss.deployment.unit. "Ruby-ds.xml".PARSE: Failed to process phase PARSE of deployment "Ruby-ds.xml"
10:43:12,893 ERROR [org.jboss.msc.service.fail] (MSC service thread 1-2) MSC00001: Failed to start service jboss.deployment.unit. "RubyGrand.war".PARSE: org.jboss.msc.service.StartException in service jboss.deployment.unit. "RubyGrand.war".PARSE: Failed to process phase PARSE of deployment "RubyGrand.war"
JBAS014777: Services which failed to start: service jboss.deployment.unit. "RubyGrand.war".PARSE: org.jboss.msc.service.StartException in service jboss.deployment.unit. "RubyGrand.war".PARSE: Failed to process phase PARSE of deployment "RubyGrand.war"
service jboss.deployment.unit. "Ruby-ds.xml".PARSE: org.jboss.msc.service.StartException in service jboss.deployment.unit. "Ruby-ds.xml".PARSE: Failed to process phase PARSE of deployment "Ruby-ds.xml"
10:45:51,507 INFO [org.jboss.as.server.deployment] (MSC service thread 1-1) JBAS015876: Starting deployment of "RubyGrand.war"
10:46:30,714 ERROR [org.jboss.msc.service.fail] (MSC service thread 1-1) MSC00001: Failed to start service jboss.deployment.unit. "RubyGrand.war".PARSE: org.jboss.msc.service.StartException in service jboss.deployment.unit. "RubyGrand.war".PARSE: Failed to process phase PARSE of deployment "RubyGrand.war"
10:46:39,076 INFO [org.jboss.as.server.deployment] (MSC service thread 1-2) JBAS015876: Starting deployment of "Ruby-ds.xml"
10:46:39,086 ERROR [org.jboss.msc.service.fail] (MSC service thread 1-2) MSC00001: Failed to start service jboss.deployment.unit. "Ruby-ds.xml".PARSE: org.jboss.msc.service.StartException in service jboss.deployment.unit. "Ruby-ds.xml".PARSE: Failed to process phase PARSE of deployment "Ruby-ds.xml"
14:39:37,249 INFO [org.jboss.as.clustering.infinispan] (ServerService Thread Pool -- 31) JBAS010280: Activating Infinispan subsystem. 14:39:48,153 INFO [org.jboss.as.server.deployment] (MSC service thread 1-3) JBAS015876: Starting deployment of "Nest-ds.xml"
14:39:48,153 INFO [org.jboss.as.server.deployment] (MSC service thread 1-1) JBAS015876: Starting deployment of "swank.war"
14:39:48,559 ERROR [org.jboss.msc.service.fail] (MSC service thread 1-3) MSC00001: Failed to start service jboss.deployment.unit. "Nest-ds.xml".PARSE: org.jboss.msc.service.StartException in service jboss.deployment.unit. "Nest-ds.xml".PARSE: Failed to process phase PARSE of deployment "Nest-ds.xml"
14:39:59,604 ERROR [org.jboss.msc.service.fail] (MSC service thread 1-2) MSC00001: Failed to start service jboss.deployment.unit. "swank.war".PARSE: org.jboss.msc.service.StartException in service jboss.deployment.unit. "swank.war".PARSE: Failed to process phase PARSE of deployment "swank.war"
JBAS014777: Services which failed to start: service jboss.deployment.unit. "Nest-ds.xml".PARSE: org.jboss.msc.service.StartException in service jboss.deployment.unit. "Nest-ds.xml".PARSE: Failed to process phase PARSE of deployment "Nest-ds.xml"
service jboss.deployment.unit. "swank.war".PARSE: org.jboss.msc.service.StartException in service jboss.deployment.unit. "swank.war".PARSE: Failed to process phase PARSE of deployment "swank.war"
17:09:34,348 INFO [org.jboss.as.clustering.infinispan] (ServerService Thread Pool -- 31) JBAS010280: Activating Infinispan subsystem. 17:09:40,510 INFO [org.jboss.as.server.deployment] (MSC service thread 1-3) JBAS015876: Starting deployment of "swank.war"
17:09:40,510 INFO [org.jboss.as.server.deployment] (MSC service thread 1-2) JBAS015876: Starting deployment of "Nest-ds.xml"
17:09:40,884 ERROR [org.jboss.msc.service.fail] (MSC service thread 1-3) MSC00001: Failed to start service jboss.deployment.unit. "Nest-ds.xml".PARSE: org.jboss.msc.service.StartException in service jboss.deployment.unit. "Nest-ds.xml".PARSE: Failed to process phase PARSE of deployment "Nest-ds.xml"
17:09:52,740 ERROR [org.jboss.msc.service.fail] (MSC service thread 1-1) MSC00001: Failed to start service jboss.deployment.unit. "swank.war".PARSE: org.jboss.msc.service.StartException in service jboss.deployment.unit. "swank.war".PARSE: Failed to process phase PARSE of deployment "swank.war"
17:20:26,052 INFO [org.jboss.as.clustering.infinispan] (ServerService Thread Pool -- 31) JBAS010280: Activating Infinispan subsystem. 17:20:39,234 INFO [org.jboss.as.server.deployment] (MSC service thread 1-3) JBAS015876: Starting deployment of "swank.war"
17:20:39,234 INFO [org.jboss.as.server.deployment] (MSC service thread 1-2) JBAS015876: Starting deployment of "Nest-ds.xml"
17:20:40,907 ERROR [org.jboss.msc.service.fail] (MSC service thread 1-3) MSC00001: Failed to start service jboss.deployment.unit. "Nest-ds.xml".PARSE: org.jboss.msc.service.StartException in service jboss.deployment.unit. "Nest-ds.xml".PARSE: Failed to process phase PARSE of deployment "Nest-ds.xml"
17:20:53,889 ERROR [org.jboss.msc.service.fail] (MSC service thread 1-3) MSC00001: Failed to start service jboss.deployment.unit. "swank.war".PARSE: org.jboss.msc.service.StartException in service jboss.deployment.unit. "swank.war".PARSE: Failed to process phase PARSE of deployment "swank.war"
17:29:08,302 INFO [org.jboss.as.clustering.infinispan] (ServerService Thread Pool -- 31) JBAS010280: Activating Infinispan subsystem. 17:29:09,475 INFO [org.jboss.as.server.deployment] (MSC service thread 1-1) JBAS015876: Starting deployment of "swank.war"
17:29:09,475 INFO [org.jboss.as.server.deployment] (MSC service thread 1-3) JBAS015876: Starting deployment of "Nest-ds.xml"
17:29:09,687 ERROR [org.jboss.msc.service.fail] (MSC service thread 1-4) MSC00001: Failed to start service jboss.deployment.unit. "Nest-ds.xml".PARSE: org.jboss.msc.service.StartException in service jboss.deployment.unit. "Nest-ds.xml".PARSE: Failed to process phase PARSE of deployment "Nest-ds.xml"
17:29:21,768 ERROR [org.jboss.msc.service.fail] (MSC service thread 1-4) MSC00001: Failed to start service jboss.deployment.unit. "swank.war".PARSE: org.jboss.msc.service.StartException in service jboss.deployment.unit. "swank.war".PARSE: Failed to process phase PARSE of deployment "swank.war"
17:31:08,668 INFO [org.jboss.as.clustering.infinispan] (ServerService Thread Pool -- 31) JBAS010280: Activating Infinispan subsystem. 17:31:09,843 INFO [org.jboss.as.server.deployment] (MSC service thread 1-3) JBAS015876: Starting deployment of "swank.war"
17:31:09,843 INFO [org.jboss.as.server.deployment] (MSC service thread 1-1) JBAS015876: Starting deployment of "Nest-ds.xml"
17:31:10,094 ERROR [org.jboss.msc.service.fail] (MSC service thread 1-2) MSC00001: Failed to start service jboss.deployment.unit. "Nest-ds.xml".PARSE: org.jboss.msc.service.StartException in service jboss.deployment.unit. "Nest-ds.xml".PARSE: Failed to process phase PARSE of deployment "Nest-ds.xml"
17:31:21,397 ERROR [org.jboss.msc.service.fail] (MSC service thread 1-4) MSC00001: Failed to start service jboss.deployment.unit. "swank.war".PARSE: org.jboss.msc.service.StartException in service jboss.deployment.unit. "swank.war".PARSE: Failed to process phase PARSE of deployment "swank.war"
JBAS014777: Services which failed to start: service jboss.deployment.unit. "swank.war".PARSE: org.jboss.msc.service.StartException in service jboss.deployment.unit. 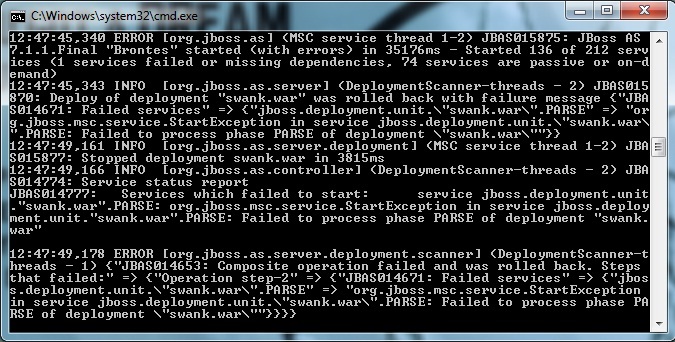 "swank.war".PARSE: Failed to process phase PARSE of deployment "swank.war"
service jboss.deployment.unit. "Nest-ds.xml".PARSE: org.jboss.msc.service.StartException in service jboss.deployment.unit. "Nest-ds.xml".PARSE: Failed to process phase PARSE of deployment "Nest-ds.xml"
12:47:22,917 INFO [org.jboss.as.clustering.infinispan] (ServerService Thread Pool -- 31) JBAS010280: Activating Infinispan subsystem. 12:47:31,734 INFO [org.jboss.as.server.deployment] (MSC service thread 1-1) JBAS015876: Starting deployment of "swank.war"
12:47:45,312 ERROR [org.jboss.msc.service.fail] (MSC service thread 1-2) MSC00001: Failed to start service jboss.deployment.unit. "swank.war".PARSE: org.jboss.msc.service.StartException in service jboss.deployment.unit. "swank.war".PARSE: Failed to process phase PARSE of deployment "swank.war"
Failed to process phase PARSE of deployment "Ruby-ds.xml"